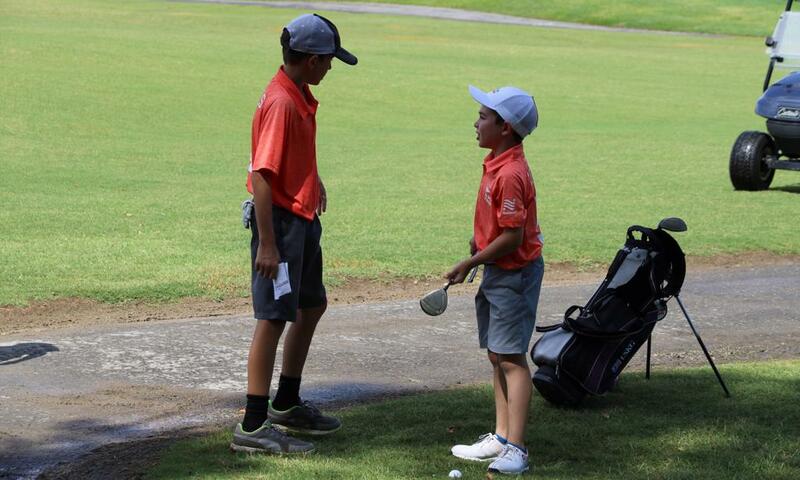 Teaching kids to "win a hole without a club in their hands"
Thirteen-year-old Grayson Manis (left) pictured with teammate Nicholas Maynard, 8. Manis, one of the top players on the team who will be competing in Regionals, is “caddying” for Maynard, who is a younger player new to the game. This is the message PGA Professional and PGA Jr. League Captain Chris Woods imparted on all of his players before the season even started at Cattails at Meadowview Golf Course in Kingsport, Tennessee. Woods, who is the owner of indoor practice and event facility Golf Amplified in Kingsport, is in his first year as a PGA Jr. League Captain. However, it’s not his first go-round with coaching youth sports. Past experience taught him there is always a potential for substitutes to act and feel unengaged, so he addressed the issue in his team's first meeting. “I set the expectation early of being engaged with teammates even when they’re not actively playing. If teammates are doing great, encourage them. If they’re struggling, how can you help them? That’s where the phrase came in,” said Woods. Woods found that this advice was particularly impactful with the more experienced players, because it encouraged them to engage in peer-to-peer mentorship. “I tell the better players, ‘I know you can win a hole with a club in your hand, so show me how you can win without it. How can you coach and mentor the younger kids?’ There’s nothing greater than peer mentorship. It will mean 10 times more coming from you than from me as the Captain,” he added. Woods shared a video of 11-year-old Kadence Ball, a beginner with relatively little golf experience, successfully hitting a shot with her teammates Grayson Manis and Kirstyn Moore cheering her on. Kirstyn’s support especially means a lot to all of Woods' players, both boys and girls, because she is such a strong player. She was serving as a substitute in this video.